Deuce Four soldiers receiving Purple Hearts. “Deuce Four,” is on its way home. I attended their departure ceremony, presided over by the much respected Brigade Commander, Colonel Robert Brown. Purple Hearts were awarded to soldiers wounded in action. 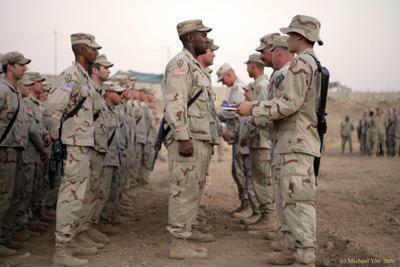 The commander of the Deuce Four, LTC Erik Kurilla, was not there to pin the medals on his soldiers; Kurilla was the last Deuce Four solider wounded in Iraq, and was recovering from three gunshot wounds. All told, the 1-24th infantry regiment earned over 157 Purple Hearts during their mission in Mosul. Shortly after the ceremony, I boarded an Air Force jet that landed in Qatar after midnight. Several friendly Air Force people asked where I intended to go. Was I hungry? Did I need a place to stay? They were extremely helpful and their hospitality was such that I was tempted to sojourn for a day. But I politely tore myself from the offer, and asked for a ride to the front gate. The Air Force obliged, calling a taxi, and they drove me to the front gate to wait for the taxi. I walked off base and sat in the desert darkness. By then it was about three in the morning. About a half hour later, headlights were cutting towards me down the desert road. More than eight months of embed with American combat soldiers ended. I already missed them, but I sure was happy to be out of that war. The past eight months taught me a few things, and so I have been busy re-equipping and revising my strategy to return to combat. During my first stay with the soldiers, my work was not efficient as it might have been. Technical and communication glitches dammed up the words. I could have written many more dispatches had the process been streamlined. In addition to working through these by reviewing options for high-tech satellite communications gear, better systems for managing the publication of dispatches are now in place. Some of these new systems are apparent by looking around the page. The new look on the blog is due mostly to the hard work of a volunteer I have never met named Ryan Franklin. Ryan’s help has accelerated the process--and as countless readers have said, he did an excellent job with the new look. In fact, the new look was largely the result of his intense labor. I only write and shoot photos. On the tactical, combat level, oftentimes during night missions, for instance, I was disadvantaged in keeping up with American soldiers; my new night vision gear, paid for by gracious readers, will close that gap. My camera and computer gear are also undergoing upgrades, enabling better performance in harsh environments. As to my own protective gear, I’ll have better and more of it. It may subject me to a lot of ribbing from soldiers, but I’ve seen a lot of folks shot and blown up this year, and am doing my best to avoid that fate. During this temporary re-quipping and organizing phase, I will also post a few more dispatches about Iraq. One of these, Battle for Mosul IV, I tried to post many times from Mosul, only to have the fighting interrupt the writing. But before posting Battle for Mosul IV, I wanted to give this update, along with an explanation about the fate of a very sick little Iraqi girl named Rhma, who is mentioned in Battle for Mosul III. As much as I would like to say that this little girl’s case has met a happy ending, so far that has not happened. After incredible amounts of work from soldiers in the Deuce Four, who had the assistance of civilians back home, our surgeon, Major David Brown, helped arrange for Rhma to get treatment in the United States. This was the best news I had heard in a long time. Few people will ever know the terrific efforts that went into saving this little girl’s life. Sadly, due to a snag in paperwork with US Immigration, a very sick child is stuck in Jordan. Her well being, possibly her life, is on hold over some trivial forms. It was as if she had been found and lifted by angels, only to be stopped and left to sit outside the gates while nameless guards check her ID card against the roster. The only thing certain is that without treatment Rhma will die.